Garage doors are heavy, and opening one in the rain or at night can be a pain, especially if you have to do it in a hurry. This is one reason why automatic door openers with remote control modules are practically standard equipment in homes with garages. Liftmaster is a well-known manufacturer that sells a variety of chain-, belt- and screw-driven models, and when you're having trouble with one of their products, you can usually find your questions answered on their website. Many common problems are easy to fix yourself. 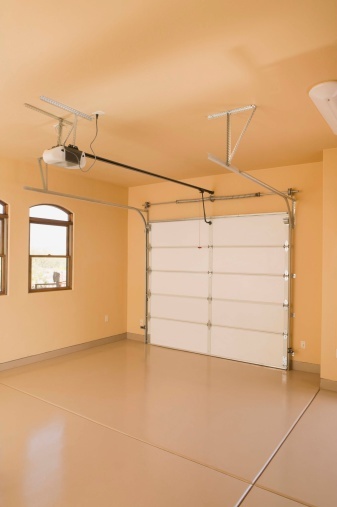 The door opener itself is in a casing mounted on the garage ceiling or wall. On either side of the track, near the floor, you'll find a pair of LED safety sensors that stop the door from moving when something is in the door opening. The sensors connect to the opener by a length of 16-gauge wire, and the opener itself usually gets its power from a 120-volt circuit in the home's electrical system via a 12-gauge plug. When your opener won't operate, always check the plug for power. If it's dead, a breaker in the main panel has probably tripped. When the door won't close, or it closes only part way and immediately opens again, the safety sensors are the first thing to check. You may find something blocking the light that passes between them, or you may find that cleaning the lenses solves the problem. Look also for cobwebs on the door tracks, because they could also be blocking the light. If you see a blinking light on one of the sensors, it means they aren't aligned. Loosen one of them and adjust it until the light shines steadily. Another reason for the sensors to misalign is that the door track is loose. If this is the case, tighten the bolts with a wrench. You can access and program most of the motor functions with the remote control. If the door won't close or open all the way, you can use the remote to reset the open and close limits. On most models, you can also do this manually by locating the limit dials on the motor housing. Turn the close limit dial counterclockwise to lengthen the close limit, and turn the open limit dial clockwise to lengthen the open limit. If your door opener is brand new, the remote won't work until you program it. Follow the procedure in your owner's manual for doing this. When a remote stops working on an existing door opener, it's often because you need to change the batteries. If you have a wall-mounted model, check the lock switch. If it's on, the remote won't work, so turn it off. Newer Liftmaster openers feature an error code system that consists of a series of flashing lights. You need you manual to decipher the error, so it's always a good idea to save it. If you lose your manual, you can access it online at the Liftmaster website.